Having minored in film studies in college, I have developed a bit of a cinematic vocabulary that might not be readily understood by the average viewer. Herein I offer brief definitions of some typical jargon. Back Projection: A technique used in studio shooting whereby the background of a scene is actually a movie being projected onto a white screen behind the actors. The projection comes from behind the screen, thus the name. It is easily identified when the background of a scene looks considerably more blurry than the actors in the foreground. It is often used for exterior locations and the view out the back or sides of a moving car. Canted Angle: A view of a scene that is tilted off center. This is often used to indicate something is amiss. Chiaroscuro: Images marked by strong contrast between light and dark. 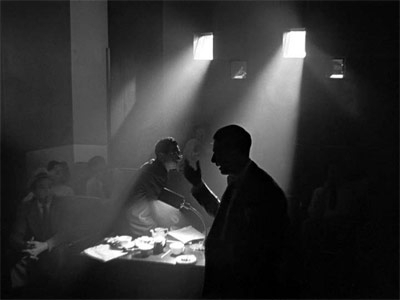 In film this is most often employed in black and white movies through the use of lighting or scenic devices. Cinematography: Camerawork including angles, distance of shots, duration of takes. Deep Focus Shot/Depth of Field: A means of using the camera to ensure everything both close up and far away is in focus. Deep Focus Shot: "Citizen Kane"
Diegetic Sound: Sound or music that comes from something within a scene, such as a piano sound coming from a piano. Establishing Shot: A shot used to establish where a scene is taking place. This might be of the outside of a building before action cuts to a scene within the building. It can also be used to show the set up of a scene before the camera cuts to close ups. Eyeline Match: A cut between a character looking at something and the something at which the character gazes. For instance, a telephone rings and we see a character glance off screen. The next shot is of the telephone. Jump Cut: A form of editing that essentially removes a couple frames of film from the middle of a scene so the subject seems to jump from one position to the next instead of adhering to natural continuity of movement. The technique was pioneered as part of the French New Wave class of directors. See Jean Luc Goddard’s Breathless. Long Shot: When the subject of the shot (i.e. a building, person etc.) is a long distance away. Long Take: When the period of time between two cuts is particularly long. See Hitchcock’s Rope, which is composed of continuous long takes with almost imperceptible cuts. Mise-en-Scene: Literally “put into the scene” and meaning everything seen in front of the camera (such as sets, props, actors, etc.). Nondiegetic Sound: Sound that does not have its source within the scene, such as the movie soundtrack. Shot-Countershot: A typical type of editing from early film periods typically employed when two characters are engaged in a conversation. The camera will focus on one character and switch to the other while they are speaking. Sound Bridge: When the music or sound from one scene continues over a cut into a new scene. I really like your idea for this list of cinematic techniques. I have been watching classic films for a considerably longer time than you, and have really never actually studied those aspects. I notice and appreciate them, just didn’t know their names!